Drs. 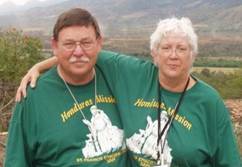 Donald and Bobbi Hopkins went on their first mission trip to Honduras in 1999. Dr. Hopkins knew immediately that he wanted to commit the rest of his life to working in Honduras and alleviating the poverty and suffering he witnessed there. Dr. Hopkins is a practicing physician dividing his time as an emergency room physician and a nursing home physician. His wife, Dr. Bobbi Hopkins, is a retired nurse practitioner who volunteers fulltime for the nonprofit. Don and Bobbi Hopkins conducted their first medical mission trip to Honduras with a team of twenty volunteers. That mission trip has returned every year since, except 2009 when the country’s political crisis caused the cancellation of all mission trips into the country. The team now averages 70-75 people—doctors, dentists, nurses, EMTs, pharmacists, clergy, translators, and support personnel. The medical brigade travels to Honduras in July, spending a week breaking into four-five medical teams that visit different rural villages in the mountains of El Paraiso. In a typical week, the brigades will see on average 2500 patients, although the July 2011 medical teams saw a record-breaking 3,300 patients. It was in the course of conducting the medical missions in the rural villages that the Americans realized the children from these communities do not have opportunities to go to school beyond the sixth grade. While the Honduran government provides a free, primary school education, going to school beyond the sixth grade is considered “private” and costs must be paid by the families. These rural families subsist of less than $1-$2 a day and cannot afford to send their children to secondary school. Therefore, the kids drop out of school at the sixth grade. Honduras Good Works decided to start a scholarship program to provide funds for youth from these villages to go to secondary school, and hopefully graduate from high school. This program was started in 2003 and flourishes to this day. Cindy Smith, a nurse practitioner and also a co-founder, has gone on every mission trip since the beginning. She is the passionate director of the Education Program. The founders also learned that these rural villages are typically “unchurched.” Due to the remote and inaccessible locations of the villages, clergy from the cities do not travel to and minister to these villages. The founders recognized the need to help villagers develop their own churches and clergy. At a conference in Copan, the Bishop of Honduras Lloyd Allen recommended that everyone involved in charitable work in Honduras read When Helping Hurts…How to Alleviate Poverty Without Hurting the Poor…and Yourself, by Steve Corbett and Brian Fikhert. Bobbi Hopkins provided members of the Board with a copy to read. As a result, Honduras Good Works adapted its approach to its charitable activities, embracing a holistic view of services to individuals and communities while endeavoring to leave a “light footprint” in the communities we serve. The organization now looks at the whole individual and the whole community. The vision, mission and purpose of the organization shifted to provide programs to enhance the HEALTH, EDUCATION and SPIRIT of the Hondurans we serve. We are a 501(c)3 that assists the people of Honduras with medical brigades, scholarship programs, and microfinance for small businesses, so they can break the cycle of poverty and alter the destiny of their country.